Mainly Business Studies: Арте́льный горшо́к гу́ще кипи́т. If people find that a team isn't working or some people are working harder than others then they could decide to get rid of one of the members. As things are progressing very fast outside and away from the blogs, you may decide that you wish to make the team smaller. "You know what normally I really hate work as a team because the thing is that if you work as a team, some people work harder than others and think why would I have to work harder than them?But for this time, I think we should work as a team but not as an individual. We should do our best to make as perfect we can reach. Maybe, it is going to be hard but we still gotta try." если опоздаете, вам будет фигово (русская и казахские девушки вас отпинают). The rewards will be beyond your highest hopes - but will only go to those who fully contribute. Teamwork is also part of the Business Studies syllabus so at the very least you are learning the theory by practical work! The key is understanding roles - who is the co-ordinator, the designer, the researcher, the motivator? All of you have been instructed to create podcasts and all have you been advised to learn Desk Top Publishing. This will help your A levels and give you important skills. It's also quite fun. When a team is performing at its best, you’ll usually find that each team member has clear responsibilities. Just as importantly, you’ll normally see that every role needed to achieve the team’s goal is being performed fully and well. But often, despite clear roles and responsibilities, a team will fall short of its full potential. How often does this happen in the teams you work with? Perhaps some team members don't complete what you expect them to do. Perhaps some team members are not quite flexible enough, so things 'fall between the cracks'. Maybe someone who is valued for their expert input fails to see the wider picture, and so misses out tasks or steps that others would expect. Or perhaps one team member become frustrated because he or she disagrees with the approach of another team members. Dr Meredith Belbin studied team-work for many years, and he famously observed that people in teams tend to assume different “team roles”. He defines a “team role” as “a tendency to behave, contribute and interrelate with others in a particular way" and named nine such team roles that underlie team success. Belbin suggests that, by understanding your team role within a particular team, you can develop your strengths and manage your weaknesses as a team member, and so improve how you contribute to the team. Team leaders and team development practitioners often use the Belbin model to help create more balanced teams. Teams can become unbalanced if all team members have similar styles of behavior or team roles. If team members have similar weakness, the team as a whole may tend to have that weakness. 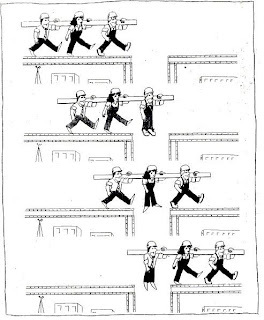 If team members have similar team-work strengths, they may tend to compete (rather than co-operate) for the team tasks and responsibilities that best suit their natural styles. So you can use the model with your team to help ensure that necessary team roles are covered, and that potential behavioral tensions or weaknesses among the team member are addressed. Belbin's "team-roles" are based on observed behavior and interpersonal styles. Whilst Belbin suggests that people tend to adopt a particular team-role, bear in mind that your behavior and interpersonal style within a team is to some extent dependent on the situation: It relates not only to your own natural working style, but also to your interrelationships with others, and the work being done. Be careful: You, and the people you work with, may behave and interact quite differently in different teams or when the membership or work of the team changes. Also, be aware that there are other approaches in use, some of which complement this model, some of which conflict with it. By all means use this approach as a guide, however do not put too much reliance on it, and temper any conclusions with common sense. Belbin identified nine team roles and he categorized those roles into three groups: Action Oriented, People Oriented, and Thought Oriented. Each team role is associated with typical behavioral and interpersonal strengths. Belbin also defined characteristic weaknesses that tend to accompany the team-role. He called the characteristic weaknesses of team-roles the "allowable" weaknesses; as for any behavioral weakness, these are areas to be aware of and potentially improve. Shapers are people who challenge the team to improve. They are dynamic and usually extroverted people who enjoy stimulating others, questioning norms, and finding the best approaches to problems. The Shaper is the one who shakes things up to make sure that all possibilities are considered and that the team does not become complacent. Shapers often see obstacles as exciting challenges and they tend to have the courage to push on when others feel like quitting. Their potential weaknesses may be that they're argumentative, and that they may offend people's feelings. Implementers are the people who get things done. They turn the team's ideas and concepts into practical actions and plans. They are typically conservative, disciplined people who work systematically and efficiently and are very well organized. These are the people who you can count on to get the job done. On the downside, Implementers may be inflexible and somewhat resistant to change. Completer-Finishers are the people who see that projects are completed thoroughly. They ensure there have been no errors or omissions and they pay attention to the smallest of details. They are very concerned with deadlines and will push the team to make sure the job is completed on time. They are described as perfectionists who are orderly, conscientious, and anxious. However, a Completer-Finisher may worry unnecessarily and find it hard to delegate. Coordinators are the ones who take on the traditional team-leader role and have also been referred to as the chairmen. They guide the team to what they perceive are the objectives. They are often excellent listeners and they are naturally able to recognize the value that each team members brings to the table. They are calm and good-natured and delegate tasks very effectively. Their potential weaknesses are that they may delegate away too much personal responsibility, and may tend to be manipulative. Team Workers are the people who provide support and make sure the team is working together. These people fill the role of negotiators within the team and they are flexible, diplomatic, and perceptive. These tend to be popular people who are very capable in their own right but who prioritize team cohesion and helping people getting along. Their weaknesses may be a tendency to be indecisive, and maintain uncommitted positions during discussions and decision-making. Resource Investigators are innovative and curious. They explore available options, develop contacts, and negotiate for resources on behalf of the team. They are enthusiastic team members, who identify and work with external stakeholders to help the team accomplish its objective. They are outgoing and are often extroverted, meaning that others are often receptive to them and their ideas. On the downside, they may lose enthusiasm quickly, and are often overly optimistic. The Plant is the creative innovator who comes up with new ideas and approaches. They thrive on praise but criticism is especially hard for them to deal with. Plants are often introverted and prefer to work apart from the team. Because their ideas are so novel, they can be impractical at times. They may also be poor communicators and can tend to ignore given parameters and constraints. Monitor-Evaluators are best at analyzing and evaluating ideas that other people (often Plants) come up with. These people are shrewd and objective and they carefully weigh the pros and cons of all the options before coming to a decision. Specialists are people who have specialized knowledge that is needed to get the job done. They pride themselves on their skills and abilities, and they work to maintain their professional status. Their job within the team is to be an expert in the area, and they commit themselves fully to their field of expertise. This may limit their contribution, and lead to a preoccupation with technicalities at the expense of the bigger picture. Action Oriented Roles Shaper Challenges the team to improve. Implementer Puts ideas into action. Completer Finisher Ensures thorough, timely completion. People Oriented Roles Coordinator Acts as a chairperson. Resource Investigator Explores outside opportunities. Thought Oriented Roles Plant Presents new ideas and approaches. The Belbin Team Roles Model can be used in several ways: You can use it to think about team balance before a project starts, you can use it to highlight and so manage interpersonal differences within an existing team, and you can use it to develop yourself as a team player. The tool below helps you analyze team membership, using the Belbin team roles as checks for potential strengths and weakness. Over a period of time, observe the individual members of your team, and see how they behave, contribute and behave within the team. Now list the members of the team, and for each person write down the key strengths and characteristics you have observed. (You may also want to note down any observed weaknesses). Compare each person's listed strengths and weakness with the Belbin's descriptions of team-roles, and note the one that most accurately describes that person. Which team roles are missing from your team? And from this, ask yourself which strengths are likely to be missing from the team overall? Is there are prevalent team role that many of the team members share? Among teams of people that do the same job, a few team roles often prevail. For example, within a research department, the team roles of Specialist and Plant may prevail. A team of business consultants may mainly comprise Team Workers and Shapers. Such teams may be unbalanced, in that they may be missing key approaches and outlooks. If the team is unbalanced, first identify any team weakness that is not naturally covered by any of the team members. Then identify any potential areas of conflict. For example, too many Shapers can weaken a team if each Shaper wants to pull the team in a different direction. Once you have identified potential weakness, areas of conflict and missing strengths, consider the options you have to improve and change this. Whether an existing team member could compensate by purposefully adopting different a team role. With awareness and intention, this is sometimes possible. Whether one or more team members could improve how they work together and with others to avoid potential conflict of their natural styles. Whether new skills need to brought onto the team to cover weaknesses. Remember not to depend too heavily on this idea when structuring your team – this is only one of many, many factors that are important in getting a team to perform at its best. That said, just knowing about the Belbin Team Roles model can bring more harmony to your team, as team members learn that there are different approaches that are important in different circumstances and that no one approach is best all of the time. Who will take which role?